All Hallows Eve has finally arrived, the night when we celebrate all things unworldly, undead, unholy, and unknown. Or in other words, the night when kids can load up on free candy without fear of repercussions! Seances became fashionable, and famous celebrities of the time participated. Ouija boards were popular, as were “spirit tables,” and many shady characters took advantage of mourners. Photographers of the day made a “killing” by experimenting with special effects to make it look like spiritual entities were lurking in the tintypes’ backgrounds. What we now consider to be spooky, Victorians considered seances to be consoling and intimate. If you dare, you can participate in a Victorian seance at various locations around the country. The most popular place, of course, is in Gettysburg. It won’t take much effort to summon ghosts there. I met a nice young man last weekend who, once he found out I was a Civil War author, proceeded to tell me about the house he grew up in near Nashville. When I asked if it was haunted, he nearly turned white as a ghost, and told me that he had witnessed strange, scary, unexplainable things. I can’t wait to hear more about what happened. Another friend lives in an old plantation house in Hernando, Mississippi. This house is haunted, too. Not long ago, he and another friend, (both Civil War reenactors) were sitting in the parlor area when a candlestick on the mantle rose up, floated over to the center of the room, and fell to the floor with a crash on its own accord. Skeptics once, they believe in the supernatural now! It seems that every battlefield, whether significant or minor, seems to inhabit its share of Civil War ghosts. Experts of the supernatural say that people who die sudden, unexpected, violent deaths are the ones whose souls get caught in limbo. Common occurrances are the sounds of gunfire, men yelling and marching, and ghostly apparitions of soldiers roaming around. Gettysburg is the most famous haunted battlefield. It is believed that this is because it lies on a lei line (mineral deposits under the soil that criss-cross). These places attract apparitions because the electrical current caused by the lei lines coaxes spirits like moths to a flame. Voted “America’s Most Haunted,” Devil’s Den on the battlefield is so charged with energy from ghosts that people have difficulty taking pictures. The spirits drain the charge from their batteries within minutes. Besides the battlefield, numerous structures in town are also rumored to be haunted. 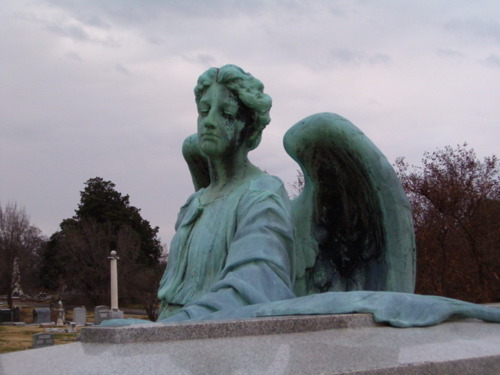 Vicksburg National Military Park in Mississippi has plenty of supernatural inhabitants as well. It is no wonder, since the citizens and Confederate army were under siege for weeks, forced to live in caves along the riverbank and eat vermin, dogs, etc. in order to survive. The town is filled with old abandoned buildings, but it is rumored that many are not completely empty. Spirits have been seen wandering the streets at night, along with frequenting local establishments, including old antebellum homes that have been converted into bed-and-breakfasts. The Battle of Chickamauga was the second bloodiest battle of the Civil War (Gettysburg being the first). Besides sightings of the usual soldier-ghosts, an entity that has come to be known as “Old Green Eyes,” and over the years, has been sighted by thousands of people. The creature sounds like something straight of a Grimm fairytale. With a hairy body, fang-like teeth, and glowing green eyes, it walks upright on two legs and wears a cloak. Besides Old Green Eyes, a woman in a wedding dress roams the area, as does a creepy soldier who stares at visitors until they leave. Halloween is one of my favorite holidays. While my kids were growing up, I enjoyed wearing costumes and going trick-or-treating as much as they did. My house was decked out in black and orange (my high school colors, BTW), rivaling Christmas in the decorations I displayed. For some reason, I’ve always been fascinated with the macabre, mysterious, and melancholy. Maybe that’s why I’m a Civil War author! During the next few weeks, in honor of the month of October and Halloween, I’m dedicating my blog to unexplained, ghostly incidents in relation to the War Between the States. 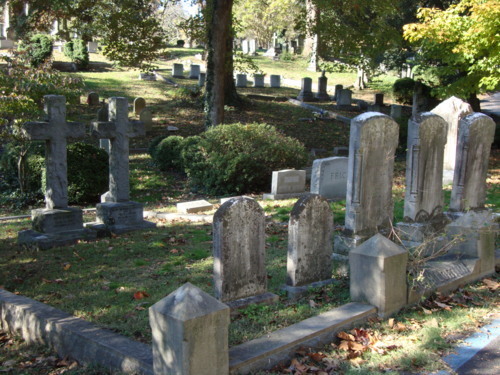 From Gettysburg to Andersonville and Chickamauga to Shiloh, tales of Civil War ghosts who never found their way home abound. Not only do these apparitions still walk the battlefields where they fell, but also dwell in their previous residences and “haunts,” so to speak. At various Civil War battlefields and historical landmarks across the country, old trees still survive that were living during the Civil War. There are two enormous, craggy old catalpa trees that still thrive on the property of the Ellwood Plantation in Fredericksburg. And even though it’s dead, an old tree stump still stands at Vicksburg National Military Park, riddled with bullets. These trees would tell quite a story if they could talk. Unfortunately, they just can’t live forever. One such casualty is a tree at Gettysburg National Military Park that recently died, estimated to have lived 147 years. The good thing is that they can live on as reminders of our precious past. The wood has been donated to the Gettysburg Foundation for use in preservation, just as bricks from old historic buildings have been auctioned off for fund raising purposes.